Shopping for Black Panther Action Figures? The Marvel Universe Black Panther Variant Play Arts Kai Action Figure has a wide range of motion while showing off his massive, yet dignified, physique. Black Panther's suit is carefully crafted with utmost importance placed on utilizing unique materials to mirror its comic book counterpart. A hard material is used to express the special metal, known as Vibranium, which makes up his nearly unbreakable armor. Meanwhile, the inner layer of his suit is made of cloth that stretches to show off his muscular body. The colors help bring out just how much of a contrast there is between the shine of the armor and the elasticity of the cloth. Multiple shades of black are adorned with silver accents, including his iconic necklace, helping provide contour and shine across his body. 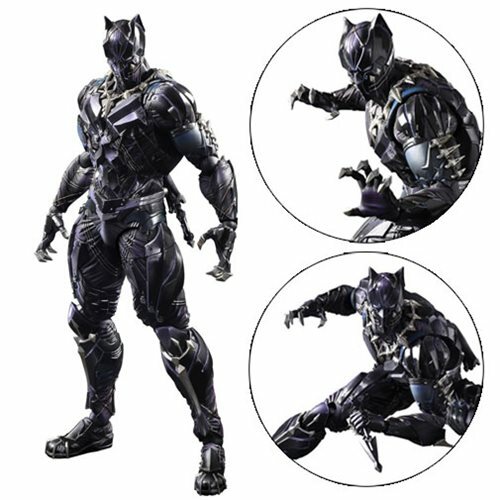 This figure's interchangeable and highly expressive parts allow you to customize him, while staying true to the charm and appeal of Black Panther's sharp and enigmatic persona. The figure measures 10 2/3-inches tall x 4-inches wide x 1 4/5-inches long, and comes packaged in a window box. Ages 15 and up.